Steve Rodriguez is instrumental in NYC’s skate landscape, designing parks and forging partnerships with sponsors and the city to make projects like the redesign of the Les Coleman Skate Park (LES Skatepark) a reality. As a founder of 5Boro Skateboards, which helped guys like Brandon Westgate, Anthony Shetler, and Aaron Suski receive international attention, it’s not uncommon to see Steve skating through NY city traffic faster than kids half his age. Walk into this park and you will more than likely have a great time. Pat Smith was the first to ollie the double set back in the day. 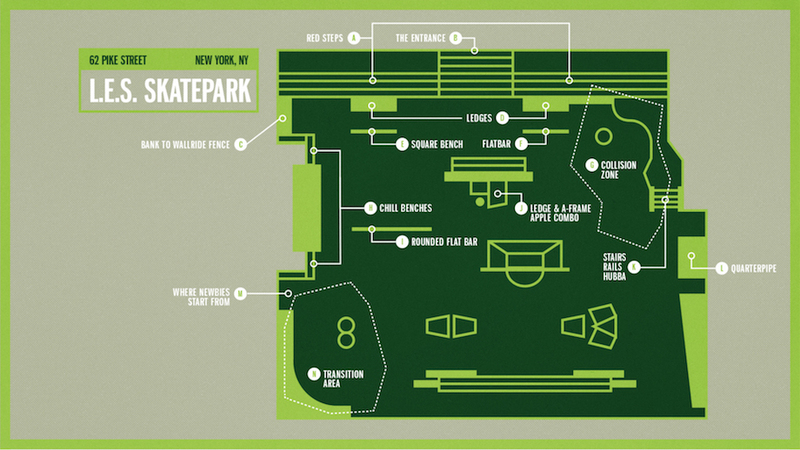 When Nike redid the park, in 2012, the double set got one step smaller. On most days, there’s a guy posted up on a cooler selling $1 waters and Gatorades for those too lazy to walk to K&K Deli on the corner. The stickiest [and] dirtiest seating of probably any skate park in the world. The plaza area at the entrance is used by [can and bottle collectors] to sort empty bottles and cans, and they just pour the remaining contents out on the sidewalk where people enter the park. As dirty as they are, the [red steps] are a great place to watch the skating [since] they are elevated enough to see the whole park. These manny/ledge combo obstacles are where people get tech. One of the most popular obstacles in the park. Again, one of the most popular obstacles in the park. [It’s] how I was able to get around the three-foot rule. I originally wanted a bank-to-wall, but when I found out that because of the three-foot rule nothing can be over three feet, I had to figure out a way to make a wall that wasn’t considered a “wall.” The mesh panel fence is actually the second fence, as the first one stretched out and failed within the first couple of days. These benches were meant to be skated but since the park is usually full, there is always someone sitting on them. Whether you are coming into the corner or out of it, you will most likely run into someone not paying attention. At 12-16 feet long, people fly at this thing. Skaters like going over stuff, and NYC is the Big Apple, so I had California Skateparks make an apple as the obstacle. I think Alex Olson ollied over the apple and into the bank. These two hips and mini corner are where most of the transition skaters stay in the park. Perfect area to “train” on, just make sure you look to the left when you land as someone will surely be dropping into the quarter pipe. Starting point for the pyramid. Newbies will keep off.